The PRO-HEAL European project will create self-x software solutions on top of IoT networks, and create a piecemeal development methodology as well as the tools necessary for this purpose. The Dutch consortium will specifically address improved robustness and reliability of large-scale distributed systems (e.g. smart buildings) as well as development of architecture and algorithms for emergent context aware behavior. Despite the recent advancements in self-configuring distributed system platforms (e.g. MyriaNed), self-protection and self-healing properties of these systems are very limited and they do not solve reliability issues that may arise in practice. To diminish the problem of complexity in distributed systems, the current trend is towards maintaining automatic operation, without human intervention. Systems have been called ”self-healing”, ”self-protecting”, ”self-aware”, ”selforganizing”, ”self-synchronizing”, ”self-configuring”. Together, such properties are referred to as self-* properties. There is an increasing demand on these self-* properties in distributed systems, such as smart buildings, health-care systems, disaster management, etc. Such systems must be able to easily adapt at runtime in response to changes in their environment. Therefore, these systems must be able to support self-* properties. We present a vision regarding the use of self-* properties, to increase the performance, security, reliability and availability, and to minimize manual intervention to reduce maintenance cost of distributed systems. 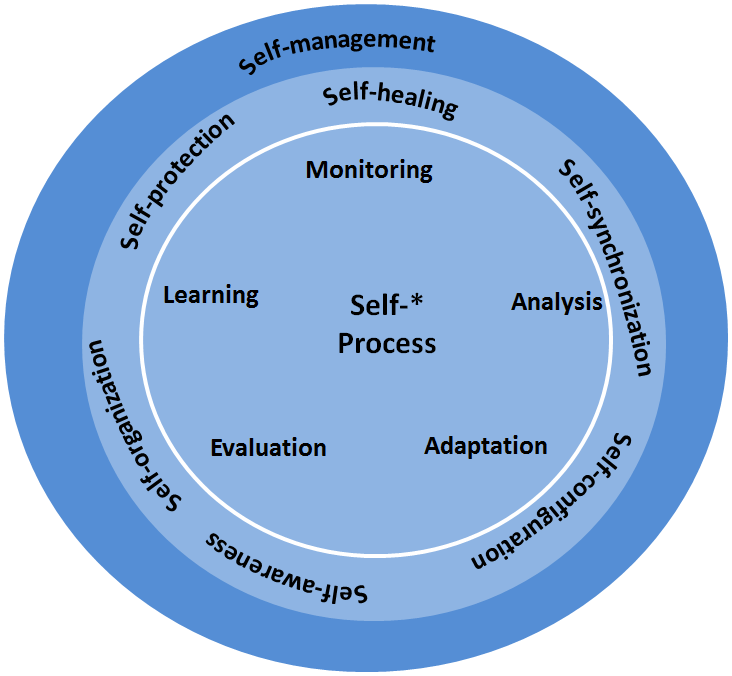 Following figure shows the envisioned generic self-* process to support self-* properties. The main goal of the ProHeal project is to create a framework and a toolkit for the implementation of self-managing properties into software systems on top of Internet of Things (IoT) networks, in order to realize self-managing systems that improve customer satisfaction and user experience and reduce maintenance/operation cost without additional development effort .